The NEW cordless Gtech HTO4 2 in 1 Garden Multi-Tool is powerful enough to trim hedges AND cut branches in one light weight garden tool. Historically cordless garden powertools have been underpowered for the jobs they are designed to tackle. But Gtech has mastered cordless technology to ensure going cordless doesn’t mean poor performance. 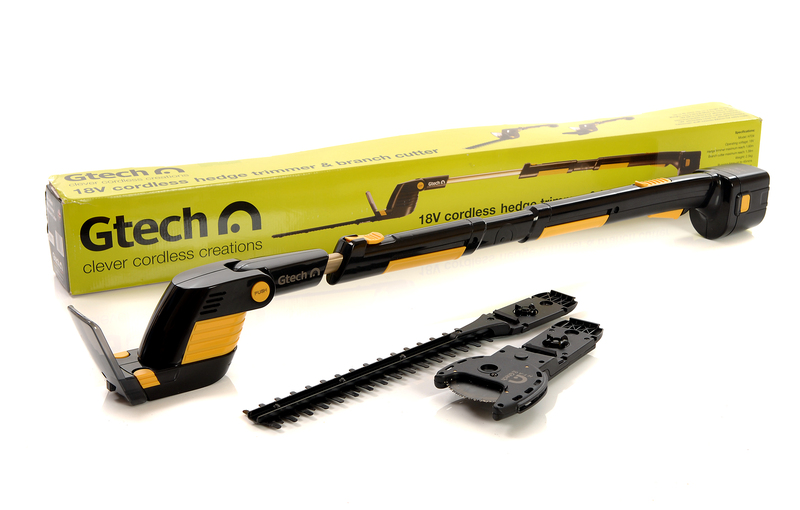 The Gtech HTO4 2 in 1 Garden Multi-Tool is incredibly robust and comes with interchangeable hedge-trimming and a branch-cutting blades. The unit features a powerful 18v motor with NiCd batteries for consistent performance and a telescopic handle to reach the top of tall hedges. The hedge trimmer head is powerful enough to cut through stems up to 15mm thick. So it's perfect for trimming all common hedging plants. And the branch cutter features a 100mm semi-enclosed circular saw blade that cuts through branches up to 3” (8cm) thick. The angle of the head can also be adjusted by up to 120 degrees. So you can reach hedge tops and work easily on hard-to-prune varieties. The 18v battery charges in 5 hours to provide a 45 minute run-time using either the hedge trimmer or branch cutter. Plenty of time to get your gardening jobs done without running out of juice. And being cordless it is portable, light and quiet. You can work around the garden without trailing cables or the need for hearing protection. Weighing just 2.5kg, the Gtech HTO4 2 in 1 Garden Multi-Tool is easier to handle than heavier garden power tools, especially when using the telescopic handle to reach higher branches. About 300,000 people are hurt in their gardens each year seriously enough to go to hospital - around 87,000 are injured actively gardening or carrying out DIY jobs in the garden. Men have more accidents in the garden than women and, apart from children, people aged 30 to 60 are most likely to be injured. Included in RoSPA’s top ten list of most dangerous garden tools are Electic hedge trimmers at number five accounting for three thousand, one hundred accidents per year. Garden power tools must always be used with an RCD - residual current device - which will cut off the power quickly in the event of an accident. The built-in safety switch of the Gtech HT04 prevents accidental starting and the unit stops instantly when you take one hand off. A protective visor also reduces the chances of small debris hitting your face. Priced £99.95 from www.gtechonline.co.uk, Amazon and all good independent garden centres, the Gtech HT04 comes with a 2 year manufacturers warranty and a 30 day money back guarantee. Spare batteries are available as an accessory at additional cost. Gtech is an independent British based designer of innovative, cordless products. For information about Gtech products, photography or samples, please contact Minx PR representatives: Michelle Redmond 020 8288 0849 / 07734 681796 / michelle@minxpr.com or Nicola Sadler on nicola_sadler@yahoo.co.uk / 07821 805433. This press release was distributed by ResponseSource Press Release Wire on behalf of Minx PR in the following categories: Men's Interest, Leisure & Hobbies, Home & Garden, Consumer Technology, Farming & Animals, for more information visit https://pressreleasewire.responsesource.com/about.